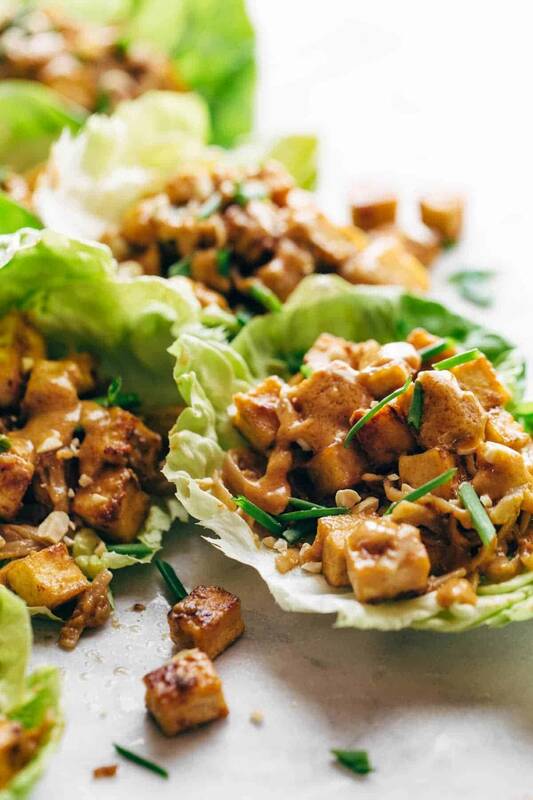 Firecracker Lettuce Wraps – I see you with your browned crispy tofu bits, your sticky brown rice noodles, your delicate lettuce leaves, and your creamy umami sauce. I see you and I love you and I want you. These lettuce wraps are a big deal, because a) they taste, obviously, aaaamazing, and b) they are lettuce wraps that know how to actually keep you full. That’s right. I said ACTUALLY KEEP YOU FULL. None of this two-tablespoons-of-ground-chicken-in-a-lettuce-leaf-counting-as-a-meal business. I LOVE lettuce wraps. I also love to be full after a meal, and sometimes it is hard to find a lettuce wrap that can deliver. Enter this delicious mashup. But wait, seriously, NOODLES. Brown rice noodles. Inside the lettuce. Like… noodle stir fry meets lettuce wrap. Also tofu, so this is vegan! But you know you can use other protein, right? Can be vegan, doesn’t have to be vegan. For our traditionalists, ground chicken is a winner, too. Everything in this lettuce wrap is drenched in my Favorite Of All Time sauce. From way back here. Naturally I am a huge supporter of anything that involves wrapping up a essential noodle stir fry and delivering it straight from plate to hand to mouth. So yes, these are my new thing of the moment. Yeah. Yeah yeah yeah yeah yeah. Here’s what we’re working with: lettuce, tofu, sauce, noodles. Pause here to stand over the pan and eat several big forkfuls. And finally, your saucy masterpiece. There is a 99% chance that you will end up with a firecracker sauce bomb all over your face / lap / fingers, but please, for the love, do not get all proper on me and start eating this with a fork. Grab a few napkins and a few friends who aren’t going to judge you for getting savage with it and just get in there. That’s the way to do it, pals. HELLO YUM. 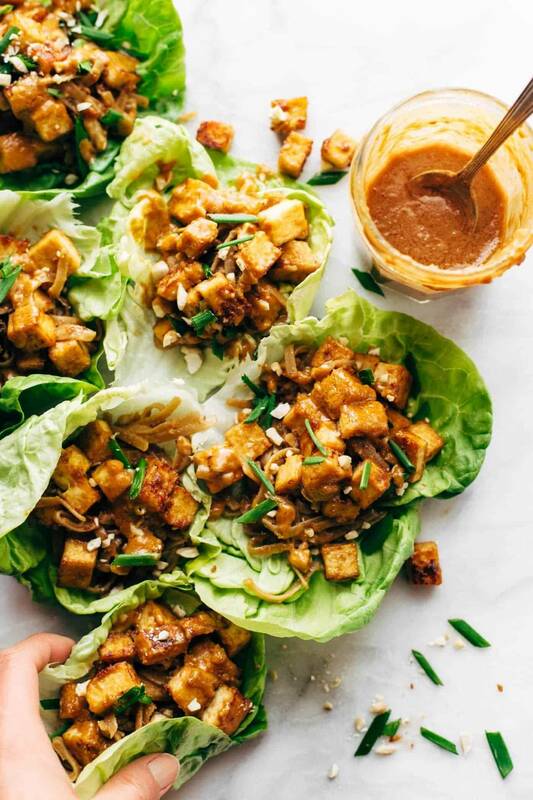 Firecracker Lettuce Wraps that are happily vegan – with crispy tofu bits, saucy brown rice noodles, and a creamy sesame sauce. Noodle Prep: Soak your noodles in a bowl of lukewarm water for at least 30 minutes while prepping the rest of the recipe. You want the noodles to be soft and flexible. Sauce: Blend all the sauce ingredients together in a small blender or food processor until smooth and creamy. Tofu: Press the tofu with a few paper towels to get some of the moisture out. Cut the tofu into small pieces. Heat a little oil in a nonstick skillet. Add your tofu. Stir-fry until golden brown. I usually let it sauté for at least 15 minutes. Add about half of the sauce to the pan. Stir-fry for another 3-5 minutes. As the sauce browns, it will form small crispy pieces around the tofu. Yum! Transfer tofu to a bowl. Noodles: Drain and rinse your noodles. Add another swish of oil to the pan and plop the noodles in. Add about half of the remaining sauce. Stir fry for just a minute or two until coated. Add a splash of water if it’s too sticky. Remove from heat immediately and toss with the tofu. Lettuce Wrap It Up: Fill your butter lettuce leaves with the noodle/tofu mixture (it’s okay if it’s sticky – you’re just wrapping it up in lettuce). Top with peanuts, cashews, cilantro, scallions, lime, and/or Sriracha if you want. YUM YUM YUM! Protein Options: It’s super easy to swap out your protein here. My two favorites are tofu (as written) and ground chicken! Soaking the Noodles: This is important. If you don’t soak the noodles long enough they will require more liquid in the pan to cook, which kind of makes them boil into a big glob. Edible? Yes. Awesome? Not really. Be sure to soak them until they are very, very soft – almost ready to eat soft. Looking delicious! I love the texture! Great recipe, thanks! I totally need to step up my tofu game. I have never cooked with it. This looks like a delicious recipe to start with! STOP with that sauce. OMG sounds amazing! I would most likely sub with chicken because I don’t think my husband would dig the tofu, but I’m loving everything about this recipe. My husband used to be quite offended by tofu. But the man married a vegetarian so over the years he has warmed up to it…how? Well i would make something utterly delish (instert above recepe) and use chicken but crumble small amounts of tofu into it. Over time the tofu would increase and eventually it would be enough for him to notice. I would reply that I add tofu every time, that he loves the dish, and admit I added more this time. Now he eats the stuff straight up. Could you sub soba noodles instead of brown rice? What a great idea!! I would think so. Oh.my.god! This is seriously some mouthwatering stuff, need to try this! These TOTALLY reminded me of the P.F. Chang’s lettuce wraps or the lettuce wraps from California Pizza Kitchen for some reason! I love how colorful and flavorful the tofu and brown rice noodle filling appears. You can even toss some of it into a salad FULL of butter lettuce, but of course, it’s way more fun to get your hands messy with lettuce wraps! Hi! This looks fantastic. Do you think almond butter would work in place of peanut butter? They’re probably medium spicy! I would start with just a little chili paste and add more to taste. Oooh, I bet I can convince the carnivores in my house to try this one! I am also a huge fan of lettuce wraps…but the ones that fill you up 🙂 genius idea adding the brown rice noodles to this, this is on a my to-make list!! Lindsay, these look super tasty! A good way to keep a meal vegetarian or vegan with some great flavor. Looks amazing!!! 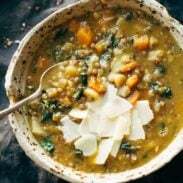 I’m working and can’t stop thinking about trying this recipe! Thank you so much for the vegan recipes and explaining how to veganize the non-vegan recipes! I am a long time fan and I am transitioning from vegetarian to vegan this year. I will be making this for dinner tonight! I loved this! Made it last night and it was a big hit. So much flavor. Thank you for this recipe. Glad to hear that, Christine! This recipe was absolutely delicious! I used ground chicken and regular rice noodles because I couldn’t find the brown rice ones and it was so good. Will definitely be making again. Thanks for another great recipe! So glad you enjoyed it, Allie! this looks easy and delicious! what butter would you suggest replacing the peanut butter in for? I am allergic to peanuts and walnuts so I haven’t tried any of your recipes with those nuts in them but really want to try this one. any suggestions? Almond butter would probably be the best sub! I always love creative meals and this is a great example. The wraps look like they would be less dense than tacos but would still be very satisfying. Plus, the green contrasts well against the rest of the colors. I made these last night for dinner! OMG delicious. My boys have requested these for after school snack today. The firecracker sauce is soooo good, I could eat it with a spoon. Thank you for a great recipe! You’re right, this is filling. In a good kind of way. It’s also fun with all the garnishes. Not the prettiest dish, but boy, is it tasty. Thanks so much for this recipe! Sounds and looks like a real winner. I know my other half will not do the tofu but maybe chicken. Lindsay, I’m completely in love with this sauce !!! Oh. My. YUM!!!! Definitely my next dinner recipe. Thanks so much for sharing! Omg this sounds delicious!! How long will the sauce keep in the fridge? I would love to make a big batch and use it on different dishes. It should keep for about 3-4 days! Would this transfer well? Like to bring to a friend who had a baby? Would I bring her the whole tofu/sauce and letttuce separate? Thanks! Hi Lydia! This travels fairly well. I’d probably reserve a little sauce for them to drizzle on too. And yes, lettuce separate from the noodle/tofu mixture!